1. Find some thread that matches the button and thread your hand sewing needle. 2. Tie a knot in the end and start the thread on the underside of the material (so that the knot is hidden). 3. Make a couple stitches to anchor your thread, then place the button where you want it. 4. As you pull the thread through, pass the needle through the first button hole and back down through the opposite hole (we’ll say the button is a traditional four-hole button). 6. Bring the needle up through the first hole again and back down through the opposite hole and repeat for all four holes, making an “X” as you sew. 7. Make enough stitches to hold the button securely in place, then end your stitching on the underside of the fabric. Pass the needle through the underside stitches a few times to anchor the end, then tie a knot and cut the thread. If your zipper teeth don’t line up, don’t just throw the piece of clothing away! It’s pretty easy to fix it. 1. With a pair of pliers, remove the metal stopper at the bottom of the zipper. 2. Unzip the zipper all the way to the bottom, but don’t remove it completely. 3. Rearrange the zipper teeth with your fingers until the settle back into place. You can test out whether they’re in the right spot by slowly pulling the zipper up and paying attention. 4. Once the teeth are straight, thread a needle with a thick thread and tie a knot in the end. 5. Bring the needle up through the fabric on the side of the zipper (right where the stopper used to be), come across the zipper, and back down through the fabric on the other side. The idea is to make the thread your stopper instead of putting the old one back on. 6. Once you have enough stitches to stop your zipper, end your stitching on the underside of the fabric. Pass the needle through the underside stitches a few times to anchor the end, then tie a knot and cut the thread. Ever have a t-shirt that was your favorite until it got a big hole in the armpit? Just create one of your own clothing patches and it’ll be as good as new! 1. First, determine whether your shirt is ripped on one side of the seam (a triangular shape) or both sides of the seam (a diamond shape). 2. Cut all of the ripped threads or fabric away from the area, then make a zigzag stitch all the way around the hole so that the fabric doesn’t fray more. A. To make a zigzag stitch, thread your needle (with the same color thread as your shirt) and make a knot at the end. Then, starting from the underside, bring the needle up through the shirt about a quarter inch from the cut. D. Repeat until you have a zig-zag shaped stitch all the way around the hole. 3. Find a piece of fabric the same color as your shirt and cut a piece that’s at least 5/8″ larger than your hole. 4. Turn your shirt inside-out and put the piece of cut fabric down over the hole. 5. Pin in place (if needed) and stitch around the outside of the fabric, leaving about 1/2″ of fabric around the edges to secure it well. 6. Turn your shirt right side-out and voila! 1. With the seam ripper, remove the stitching at the bottom of your pants and unfold them completely. 3. Take off the pants and use a measuring tape to determine how much length you eliminated with your pins. Use that measurement to accurately pin both pant legs up. 4. Iron the pants at the fold to make a nice crease (and make them easier to sew). 5. 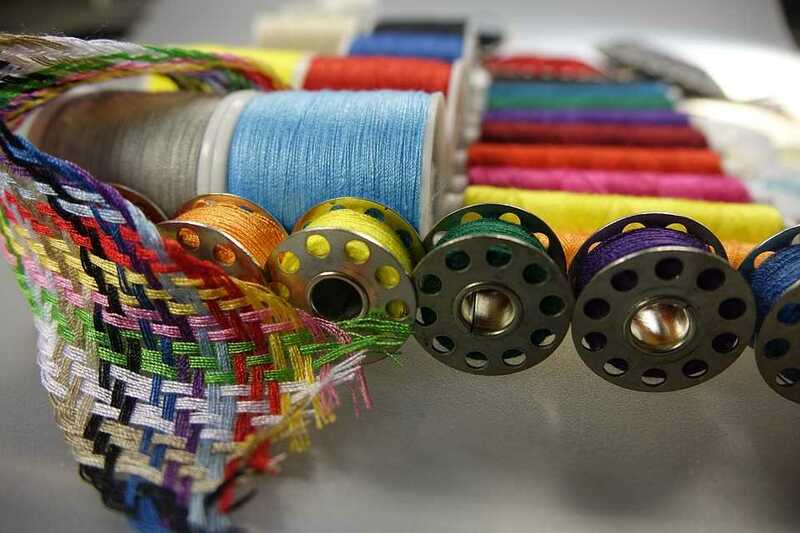 Grab a thread color that matches your pants, thread your needle, and tie a knot in the end. 6. Bring the needle up through the underside of the pant leg and make a small stitch (about 1/4″) along the bottom of the fabric. Make sure to leave about 1/2″ between the stitches and the bottom of the pants. 7. Repeat the stitches along the entire bottom of both pant legs and end your stitching on the underside of the fabric. Pass the needle through the underside stitches a few times to anchor the end, then tie a knot and cut the thread. 8. If you’ve eliminated a good amount of pant length, you may want to cut the excess fabric to keep it from bunching. This entry was posted in General Information and tagged patching, sewing, thread.